ERYICA Annual Report 2013 Copyright Â© ERYICA. All rights reserved. dear reader We are glad to present you ERYICA’s Annual Report for the year 2013. 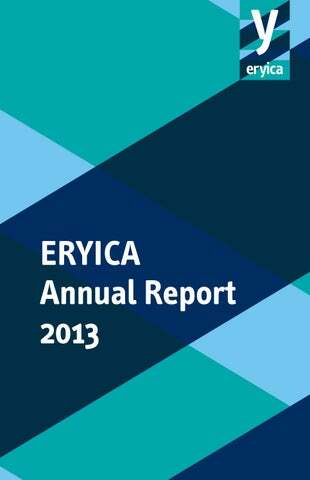 As every year, ERYICA presents the activities of the organisation during the last 12 months in an Annual Report. This year the content of the booklet has been somewhat restructured, to give a better and separate overview of activities and organisational information. I hope you will find this new arrangement easy to follow. 2013 was a year of new beginnings in several aspects. The General Assembly elected a new Governing Board, we started the Youth on the Move – InfoMobility project, as well as the preparations for the Summer University of 2014. We carried out a survey with the largest outreach so far, on the information needs of young people. And the Secretariat moved to new offices! On the other hand, 2013 was also a year of continuation. Our trainings and other services, the online support tools stayed in operation and were continuously improved. East Europe. In a certain view, this was a first, organised with an unprecedented level of cooperation and support so far, with a focus on evidence based youth information work. At the same time, the content and aims definitely underline continuity. Social inclusion of young people and their access to rights with the tools of youth information and counselling is not new but creates a ‘fil rouge’, a leitmotif along which we continue our work in the next years. ...Youth Information Generalist youth information and counselling services have been offered since 1960’s in more and more European countries. Young people who are in transition from childhood to adulthood are at a special and very important point in their lives. They have to make certain decisions that will have a significant impact on their future. The choices they make about their education, career paths and other parts of their personal lifestyle will define their lives. These autonomous first-time decisions need to be based on unbiased, complete and comprehensive information. The essential aim of youth information and counselling is to help guide young people in all aspects of their lives and in their autonomous decision-making. It builds on the fact that it is not possible to make a sound decision without knowing one’s options and alternatives. The online world made communication and search for information smoother, yet not easier. Years of getting questions and giving answers in a professional manner show that young people do need assistance in understanding how society works to make informed decisions that will shape their future. provide reliable, accurate and understandable information, give access to different sources and channels of information, give an overview of the options and possibilities available on all relevant topics, help young people sift through the information overload they face today, ensure that young people are aware of all the rights and services available to them and that they know how to access them, provide support in evaluating the information obtained and in identifying quality information, guide young people in reaching their own decisions and in finding the best options open to them, offer different channels of communication and dialogue in order to directly support young people in their search for information and knowledge, contribute to the information literacy of young people. 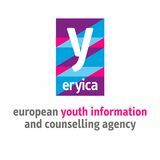 ...ERYICA is an independent European organisation, composed of national youth information co-ordination bodies and networks. ERYICAâ&#x20AC;&#x2122;s core framework documents are the European Youth Information Charter, adopted by the ERYICA General Assembly in 2004 and the Principles for Online Youth Information, adopted by the ERYICA General Assembly in 2009. It works to intensify European co-operation in the field of youth information work and services. It aims to develop, support and promote quality generalist youth information policy and practice at all levels, in order to meet the information needs of young people in Europe and to apply the principles of the European Youth Information Charter. ERYICA is an international non-governmental, non-profit association, established on 17 April 1986 in Madrid, Spain. ERYICA is registered in the Grand-Duchy of Luxemburg, in accordance with the 1928 Luxemburg law on associations. In 2013, our network consisted of 25 Members, along with 7 Affiliated and 2 Co-operating Organisationsin 27 countries. highlights of the year Symposium on Youth Policy in South East Europe The Symposium on Youth Policy in South East Europe: the Role of Information and Counselling in Young People’s Social Inclusion and Access to Rights took place in Zagreb, Croatia on 19-20 June 2013. The event was organised by the EU-CoE Youth Partnership, the Ministry of Social Policy and Youth of Croatia, the Croatian Government, ERYICA and the SALTO Resource Centre South-East Europe. Over 60 participants from across Europe were welcomed in the Croatian capital by the Deputy Prime Minister, Milanka Opaćić and Minister of Education, Zeljko Jovanović, as well as Director General of the DG EAC of the European Commission, Jan Truszczynski and Rui Gomes, from the Council of Europe’s Youth Department. The two-day event focused in particular on the role of youth information and counselling in fostering social inclusion of young people and access to their rights. Through keynote speeches, workshops and discussions, the event was looking at the issues surrounding quality, outreach and participation in the provision of information and counselling to young people. European Youth Information Day Having become a tradition by now, on 17 April 2013 the European Youth Information Day (EYID) was celebrated in the ERYICA network. The motto of this year was ‘Lost? Found! – Youth Information on Your Side’. A great deal of activities were organised by youth information centres, a sample of which was published on www.sheryica. org. The day also provided opportunity for centres belonging to an ERYICA member structure to increase their visibility and raise awareness of the information needs of young people and organisations that are working professionally to match those. 24th General Assembly (Antalya, Turkey, 18-21 April 2013) The 24th General Assembly (GA) of ERYICA was hosted by the ERYICA Affiliated Organisation GSM Youth. During the Assembly, a new President and Governing Board were elected with a mandate until the GA in 2016. Good Practice Booklet The publication showcases good practice in the ERYICA network, collecting outstanding examples of projects regarding their quality, innovative potential and their demonstrated successful outcomes. Days after the European Youth Information Day, the new edition of the â&#x20AC;&#x153;Good Practice in Youth Informationâ&#x20AC;? booklet was issued. The good practices featured in the booklet represent the actual trends and developments in youth information practice across Europe. In this edition, most of the good practices were selected from www.sheryica.org, the online platform for youth information workers that enables them to network and be inspired. The booklet aims at providing visibility to youth information practice on European level, highlighting those that are of a particularly innovative nature, which thus can serve as an inspiration for possible future projects and collaborations. The 24th ERYICA GA convened 49 participants from 19 countries. Survey on the Impact of Youth Information and Counselling In the frame of the authoring process of the Compendium on National Youth Information and Counselling Structures, youth information centres in the ERYICA network asked their visitors to fill in the Survey. The survey used the findings of the focus groups delivered by ERYICA members in 2011 and 2012 as a starting point in order to examine users’ experiences with youth information and counselling services, as well as their objections and proposals to the stakeholders in this field. Its results are included in the Compendium. The analysis of 438 answers from 14 countries showed that young people are in general satisfied with youth information and counselling services (90% being ‘very’ or ‘rather’ satisfied) and 85% of them would recommend or rather recommend the use of these services to their friends. 2nd Young Ambassadors’ Meeting The event was hosted by Solna UngInfo in Stockholm, Sweden, and it took place in the time period 27-31 May 2013. Youth information centres also proved to be both the most positively evaluated facilities (based on satisfaction with the information provided) and the most reliable source of information, with 90% of respondents finding them ‘very’ or ‘rather’ reliable. and during the development of new ERYICA services and projects. This second meeting was equally successful and Youth Ambassadors were present at all major ERYICA project meetings during the year, to the contentment of the representatives of member organisations. projects Youth on the Move – InfoMobility (YoMIM) The overarching goal of the Youth on the Move – InfoMobility (YoMIM) project is to innovate and to enhance youth work whilst fostering synergies between the main actors in the field of youth information and counselling, paying special regard to cross-border European mobility. Running between 1 February 2013 and 30 May 2014, the project aims at offering new methodological and technological solutions to meet the needs of young people on the move. InfoMobility means providing information, guidance and counselling before and during young people’s permanence in a foreign country. Remarkably, the project will establish synergies between European Youth Card issuers and youth information and counselling structures. Practically, the Youth on the Move – InfoMobility project aims at complementing the services offered by Youth Information Centres by paying special regard to young people who take part in cross-border European mobility programmes. Through the guidance and information YoMIM Guides provide, young people can optimise their stay abroad. By getting engaged in the YoMIM service, YICs can also increase and maximise their impact on the target community. The project will deliver the following concrete outcomes: •	the establishment of the YoMIM Network, consisting of Youth Information Centres with a trained YoMIM Guide; •	the creation and delivery of a YoMIM Training for the Guides, preparing them to the specificities of InfoMobility; •	the establishment of quality guidelines for the provision of the services; •	the design of an e-book template for the training manual; and •	the development of a smartphone application and a website to provide up-to-date information for young people on the move. The service is planned to become a permanent offer of Youth Information Centres that belong to the ERYICA network and as a first step towards this, YoMIM Centres will be mapped on the European Youth Portal. In 2013, the following meetings took place in the frame of the YoMIM project: YoMIM Guides: First Networking Meeting in Maribor, Slovenia on the dates of 1-5 July 2013. EURYICA Working Group on quality: 1 July 2013 in Maribor, Slovenia and 21-22 October 2013 in Vilnius, Lithuania. Training Task Force: See chapter Training Task Force below. Summer University on Youth Information and Counselling (SUYIC) Preparations of the Summer University in 2014 have already begun in 2013. Through the event, ERYICA and the partners aim to support the development of youth policy in Europe and in partners’ countries by leveraging on quality youth information and counselling. Training to Trainers To provide permanent and sufficient supply of trainers for all the training courses the Training Task Force have developed, ERYICA organized 3 training to trainers courses on a project basis during 2013.
the Summer University will consist of a number of non-formal education activities, expert presentations on youth information, group work on regional perspectives, training modules, networking activities and feedback sessions. A preparatory meeting took place in Lisbon, Portugal, on the dates of 29-30 November 2013. These prepared 46 trainers altogether on the YIntro, Digital YIntro and Jimmy – Youth Information Mediator courses. For further details, see the section ‘Training for Youth Information Workers’. services Infomobil The first international service of ERYICA is preparing for a new life under the ‘Youth on the Move – Infomobility’ (YoMIM) project. The content of the site is going to be, among others, available in a smartphone application. SHEryica By the end of 2013, SHEryica, the online platform for Youth Information workers, welcomed its 500th registered member. These Youth Information professionals come from 32 countries and 288 Youth Information Centres (dated 21.02.2014). training for youth information workers Intranet The Intranet system (first introduced in 2011) has a constantly increasing role in the everyday work of ERYICA. In 2013, the subscription, application and registration to all ERYICA events took place through an online form in this system, as well as all trainings were evaluated through an online questionnaire. YIntro Training to Trainers It also serves as a store for all corporate documents and offers co-operative working interface and storage space for members as well. Nevertheless, the most spectacular use of the system in the ERYICA network in 2013 was the ‘Young People and Information’ survey (see Highlights) that gathered data from 14 countries, in 11 languages. Training courses are designed and revised by ERYICA’s Training Task Force (TTF), gathering some of the most recognised trainers and training experts in Europe in the field of youth information work. Since 1997, ERYICA’s activities with the Council of Europe have been developing within the framework of the Partnership Agreement that is being maintained through the work of the Joint Coordinating Committee (JCC). In 2013, the JCC met in Brussels on 12 November to evaluate the partnership’s activities and plan the ones of 2014. The representatives of ERYICA in the JCC are Sanja Vuković-Čović, Miriam Teuma, Sif Vik and Davide Capecchi. Publications ERYICA’s co-operation with the Council of Europe was centred on publications in 2013. A brand new cornerstone document, the Compendium on National Youth Information and Counselling Structures, which will be published in 2014, aims at being the main systemized source of information for stakeholders in countries where no youth information and counselling structures have yet been established and countries where such structures or separate services could be significantly improved. Another publication, the Info-Rights Kit will equally be published in 2014 by the Council of Europe and translated to languages other than English. The toolkit is intended to assist youth information workers working directly with young people and can be used in non-formal education activities too. Finally, the well-established Youth Information Starter Kit was translated to further languages and is now available in English, French, German, Spanish, Russian, Macedonian and Turkish. Follow-up Group of the Campaign. ERYICA’s representative in this body is a member of the Governing Board: first Lien Vanbrabant and then Nele Bulens. Besides, ERYICA promoted the Campaign through its website, Facebook page, newsletter and direct communication to Members, encouraging them to take an active part in the Campaign and contribute to the success of its aims. Representation of ERYICA in the CDEJ Since 2008, ERYICA is an observer of the CDEJ (European Steering Committee for Youth), a statutory body of the Council of Europe that is co-managing the Youth activities and budget of the Department of Youth and Sport together, on an equal basis, with the Advisory Council on Youth. Davide Capecchi represented ERYICA, as an observer, during the meeting of 14-16 October 2013. CDEJ Summer University This year’s CDEJ Summer University was held on dates of 19-23 August 2013, in the city of Kosice, Slovak Republic. ERYICA was represented in this event by Sif Vik, ERYICA Treasurer. During the days of the event, participants from a wide range of European backgrounds had the chance to learn more about the Council of Europe and its aims particularly in the youth field and the composition of the CDEJ – European Steering Committee on Youth. Every year, the CDEJ Summer University aims to provide members of the CDEJ and the Advisory Council (notably new members) with a learning experience, which is likely to improve their motivation and capacity to actively participate in the work of the Council of Europe’s youth sector, particularly in its co-management structures. The central topic of this year’s edition was that of Roma youth. Leaving and newly elected members of the Governing Board gather at the 24th General Assembly. From left to right: Lien Vanbrabant, Sanja Vuković-Čović, Franck Chabriac, Mika Pietilä, Marc Boes, Sif Vik, Jorge Orlando Queirós and Daniel Poli. Since June 2007, the ERYICA Secretariat is based in Luxembourg. By the end of 2013, ERYICA’s membership counted 25 Members, 7 Affiliated organisations and 2 Co-operating organisations in 27 countries. ERYICA is hosting interns in the framework of the Erasmus programme. In 2013, Justine van Egroo from Belgium, Rusudan Bigvava from Georgia, Karolina Latka from Poland, Blanca Bordallo from Spain and Nikos Takantzias from Greece supported the activities of the Secretariat. why join us? Being a Member of ERYICA will enable organisations to access a number of opportunities from which all non-members are excluded. How and by what extent these can be taken advantage of strongly depends on the nature and on the needs of each organisation. Being part of a European-wide network of more than 7.500 youth information centres will allow members to: 1. Receiving support through the “Country Development Service”, a programme aiming at empowering Members under specific conditions; Contributing to the development of generalist information in Europe and supporting colleagues in this challenging task; Influencing policy making processes in Europe and different countries; Have the right to use the ERYICA logo on your website and in printed materials and claim membership, also through Members’ certificates; Be involved in the “Infomobil” service, an online platform supporting mobility of young people in Europe; Being member of SHERYICA, the interactive platform for youth information workers; Make a difference in youth information to millions of young people in Europe. December 2013: The Youth Information Starter Kit is available in 7 languages. September 2013: An ERYICA video opens the EU Youth Conference in Vilnius, Lithuania. June 2013: The Symposium on Youth Policy in South East Europe: the role of information and counselling takes place in Zagreb, Croatia. June 2013: A new group of Youth Ambassadors meet for a training. April 2013: A new Governing Board is elected for a 3-year mandata at the 24th General Assembly. April 2013: The second edition of the Good Practice in Youth Information booklet is published. February 2013: ERYICA begins the Youth on the Move – InfoMobility (YoMIM) project, the goal of which is to innovate and enhance youth work in the field of mobility. July 2012: pilot of the 5th youth information training course of the ERYICA training system, the Advanced YIntro. April 2012: launch of the Information Right Now! Campaign in partnership with the Council of Europe. June 2011: Publishing of Guide to Safety and Quality online. April 2011: 25th Anniversary Celebration of ERYICA in Opatija, Croatia. February 2011: launch of JIMMY, the Youth Information Mediator project. September 2010: Colloquy “Bridging the Gap” organised with support of the Council of Europe in Budapest, Hungary, European Youth Centre. June 2010: Launch of Council of Europe Recommendation CM/Rec(2010)8 on Youth Information. December 2009: ERYICA launches SHERYICA, the Interactive Platform for Youth Information workers and adopts the Principles for Online Youth Information. January 2009: Launch of the “A Better Youth Information for New Times” project. December 2008: Launch of ERYICA’s first project Meet the Street. April 2008: ERYICA inaugurates the European Youth Information Day, on April 17th. November 2007: ERYICA together with the Council of Europe organises a colloquy on the Future of Youth Information in Europe in Budapest, Hungary. July 2007: ERYICA office moves to Luxembourg. April 2006: ERYICA celebrates its 20th anniversary and organises a European seminar on Youth Participation together with Eurodesk and EYCA in Vienna. November 2005: Policy statement on “Indicators for a National Youth Information Policy” is adopted in Ljubljana, Slovenia. September 2005: ERYICA organises the European Seminar on “Quality Matters in Information for Young People” together with Eurodesk and EYCA in Paris. November 2004: Updated version of the “European Youth Information Charter” is adopted in Bratislava. December 2001: ERYICA releases the Minimum Basic Training Course (MBTC) module for its training of Youth Information workers. November 2000: First ERYICA Governing Board is established. July 1999: ERYICA publishes its first study on “Generalist Youth Information in Europe in 1997”. December 1998: ERYICA launches the online version of Infomobil. April 1997: Council of Europe signs a Partnership Agreement with ERYICA. December 1996: 12 organisations in 8 countries constitute ERYICA’s initial partners. April 1995: European Colloquium (Marly-le-Roi, France) recommends the creation of a framework for European cooperation in the field of “generalist” Youth Information and counselling. April 1994: ERYICA registers as a non-profit making association in Luxembourg. December 1993: 4th ERYICA General Assembly in Bratislava, Slovakia adopts the European Youth Information Charter. May 1991: ERYICA publishes the “European Directory of Youth Information Centres”: 471 centres in 18 countries. February 1990: Committee of Ministers (Council of Europe) adopt Recommendation 90/7 on “Information and Counselling to be Provided to Young People in Europe”. May 1988: 1st ERYICA General Assembly (Pomezia, Italy). August 1987: ERYICA registers as a non-profit-making association in Amsterdam. June 1987: ERYICA launches first “Guides for Young Visitors”, booklets containing practical information about European countries to promote youth mobility. April 1986: Founding of ERYICA in Madrid, Spain as the result of a constitutive Meeting.